Preheat the oven to 350°. Butter eight 6-ounce ramekins and coat with Parmigiano; tap out the excess. 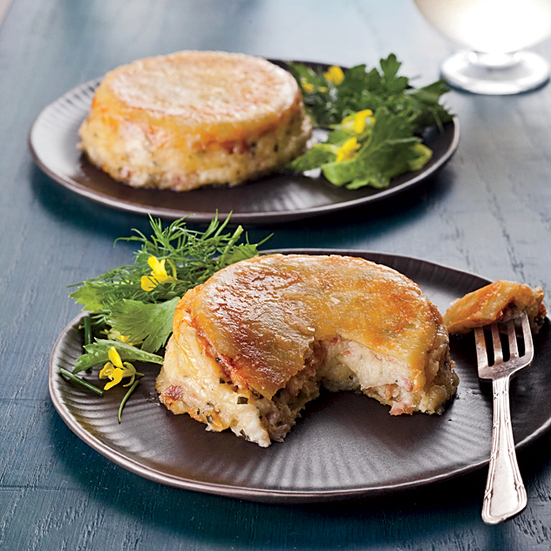 Place the ramekins on a sturdy rimmed baking sheet. In a large pot of lightly salted boiling water, cook the lasagna noodles until al dente. Drain and cool under running water. Pat dry. Using a 3 1/4-inch biscuit cutter, stamp out 24 rounds (they should fit neatly inside the ramekins). In a large saucepan, melt the 4 tablespoons of butter. Add the flour and whisk over moderately high heat for 1 minute. Add the milk and whisk over moderate heat until the sauce is bubbling and thickened, about 5 minutes. Remove from the heat and whisk in the egg, chives, parsley and 1/2 cup of the Parmigiano. Let cool slightly, then stir in the Fontina and prosciutto. Season the filling with pepper. Arrange 1 pasta round in the bottom of each ramekin. Spoon a scant 1/4 cup of the filling into each ramekin and top with another noodle; press to flatten slightly. Top with the remaining filling and pasta rounds. Sprinkle the tops with the remaining 1/4 cup of Parmigiano and cover loosely with foil. Bake the cupcakes for about 20 minutes, until the filling is just bubbling. Remove the foil and bake for about 30 minutes longer, until slightly puffed and the tops and sides are golden. Let cool for 20 minutes. Run a knife around the lasagna cupcakes, then invert onto plates, tapping firmly to release them. Serve hot or warm. The unmolded baked lasagna cupcakes can be refrigerated overnight. Reheat in a 325° oven.